In a fishbowl activity, a group of learners is selected to discuss a topic while the remaining learners observe, take notes, and later reflect upon the fishbowl discussion. 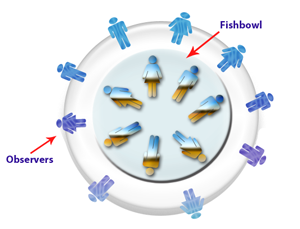 In an open fishbowl, observers can become participants, swapping places with those within the fishbowl. In a closed fishbowl, observers can’t change their roles. Fishbowls can be relatively homogeneous; e.g., fishbowl participants may be from a single team ( regulatory affairs, marketing, business leaders, etc) or can be heterogeneous (including fishbowl members from cross-functional teams). Fishbowl activities aren’t necessarily discussion activities but can be any activity that learners can observe, either synchronously, asynchronously or by some blended method. For example, observers might watch members of a team implement a procedure or simulate a role-playing scenario. A learner may be asked to listen to a particular fishbowl speaker to observe the effectiveness of his or her interactions. As a group, learners would share their observations. Fishbowl activities can be particularly useful for involving larger groups of learners in training activities, while keeping discussion manageable. This entry was posted in fishbowl activities for training and tagged discussion, fishbowl, scenarios, simulations. Bookmark the permalink.